Photograph collection of webmaster 25091 & possibly 25108 in the bay platforms at the north end of Dumfries station. The fourteen year nine month career of D5241/25091, whilst not the longest, or having the most transfers did provide allocation at depots on all five of the BR Regions, an 'honour' bestowed upon a very few mainline locomotives. Time between withdrawal & scrapping: 12 months. September 1964 to Southern Region. December 1964 to Toton (16A). July 1965 to London Divison (Midland) (D14). September 1965 to London Midland Midland Lines LMML. November 1965 to London Divison (Midland) (D14). June 1968 to London Division (Western) (D01). 25091 was the 23rd Class 25 to be withdrawn, one of three Scottish Class 25s withdrawn during October 1978. After withdrawal 25091 was stored at Eastfield until May 30th 1979 when it made the short trip to Glasgow Works, where most of it was scrapped by October 1979. The cabs however lingered until at least June 1984. Noted Glasgow Works August 1976 (full repaint). D5241 was completed at Derby Works during December 1963 and delivered to Toton (16A) during the first week of January 1964. On December 18th 1963 D5241 & D5242 made their Works test run to Corby. 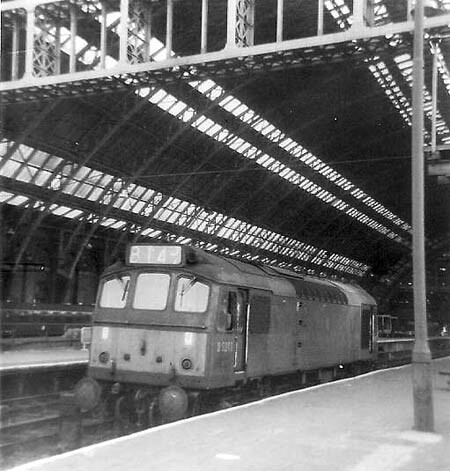 D5241 stands in the shadow of the great roof at St Pancras station on an unknown date. Photograph courtesy FW Smith. The Southern Region experienced a number of problems with some of their electric locomotives, with many temporarily sidelined awaiting attention. This created a shortage of locomotives leading to D5240 - D5245 & D5247 moving to Hither Green (73C) during September. Despite this somewhat unusual transfer there are no reports of how the locomotives were used or any photographs of them during their brief stay south of the Thames. D5214 & D5241 paid a Bank Holiday visit to Southend on an excursion from Bedford. During the middle of July a special cruise by the S.S. Manxman operated from Liverpool to Llandudno. As a way of promoting this sailing and adding a little spice to the average day trip, BR ran two excursions, one from Coventry to connect with the ship at Liverpool, the other using 5241 & 7652 took a special from Derby to Llandudno. These two machines returned the Coventry participants to Crewe, with E3004 & E3076 taking the train forward. The returning Derby travelers had 1831 from Liverpool to Crewe where the outbound 25’s took over for the run home to Derby. On October 6th a Temple Mills - Whitemoor freight was worked by 5241 & 5244. On March 8th shortly after 10am the 8M77 08.05 Whitemoor - Leicester goods train, hauled by a Class 25, believed to be 5291 was involved in collision with a loaded gravel lorry at Funtham's Lane level crossing near Whittlesea. The train was comprised of thirty two wagons (thirty loaded, two empty) and a brakevan, with a total weight, including the locomotive, of 798 tons. The loaded lorry weighed 23.5 tons. The lorry was able to enter the crossing, despite the approach of the good train because the interlocking protection between the crossing equipment and the signals had been rendered inoperative (against the Rule Book instructions) by the signalman and and signal technician. The impact occurred at about 30mph, the Class 25 hitting the rear of the lorry. The lorry was seriously damaged, separating into several parts with the front of the lorry demolishing one of the barriers. 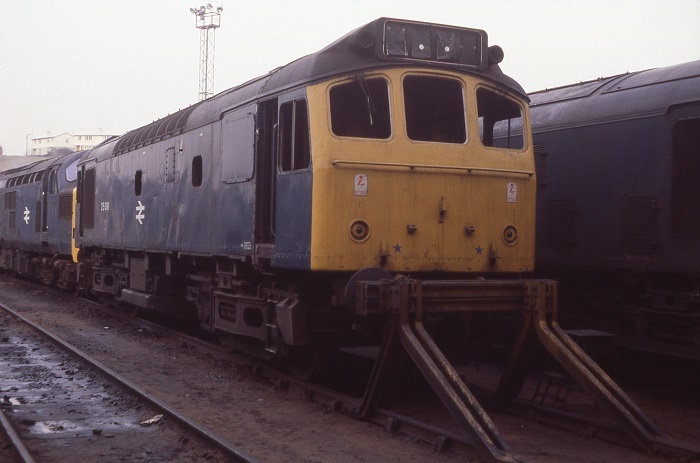 The Class 25 suffered serious cab damage to one side, enough to trap the second man, who was driving the goods train, in the cab for ninety minutes. Despite this only cuts and bruises were sustained by the locomotive crew & lorry driver. The train was not derailed and the line was reopened by early afternoon - although the Class 25 required Works attention. On at least one summer Saturday in June 5241 worked the Nottingham - Llandudno Town roundtrip. On June 24th a Leicester - Skegness roundtrip was worked by 5241. On July 28th the 14.15 Yarmouth - Derby was worked from Norwich by 5241 & 5201. On September 1st & 2nd 5241 & 7559 were active on Derby - Skegness services. 5241 was noted through Featherstone on the afternoon of December 27th with a breakdown crane. The transfer situation for 25091 and her sisters became very confused during 1975. On August 19th 25091 & 27023 worked the 12.10 Glasgow Queen Street - Dunblane. On September 4th 25091 was noted at Carlisle during the early evening having brought in a service from Glasgow Central? Photograph courtesy Mike Cooper The exhaust from a just fired up Class 40 wafts across the depot at Aberdeen giving a very atmospheric touch to this view of 25091 and one of the local 'Swindon' units used on the Inverness - Aberdeen service. 25091 was noted at Dunfermline Townhill on March 27th. 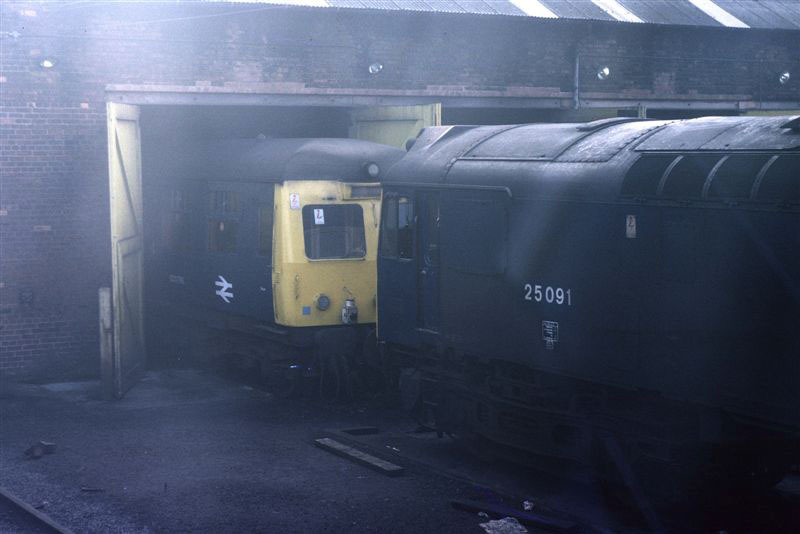 On July 29th the 22.50 Euston - Perth was worked forward from Mossend Yard by 25091 & 25083. On September 12th the 13.38 Dundee - Glasgow Queen Street was worked by 25091. At lunchtime on August 9th 25091 was noted at Aberdeen Ferryhill depot. 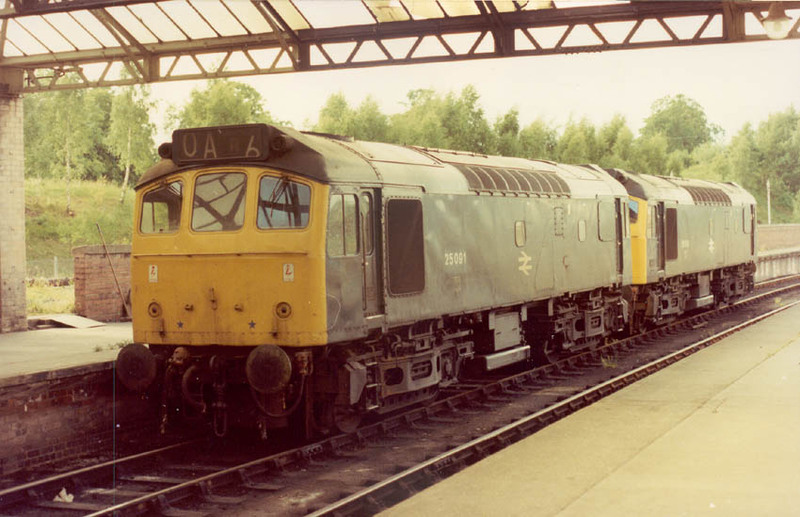 Mid-afternoon on September 10th 25091 was stabled at Eastfield along with ten other Class 25s. 25086 & 25091 worked the 'Capitals United' M&GN Society charter train departing Edinburgh Waverley for Euston on April 8th 1978, presumably going as far as Carstairs. On July 5th 25091 was noted at Carlisle with a lengthy parcels train. 25091 was withdrawn on October 15th 1978. A gloomy February 24th 1979 finds withdrawn 25091 at Eastfield slowly surrendering a multitude of parts to its more fortunate shedmates. Last updated April 23rd 2019.